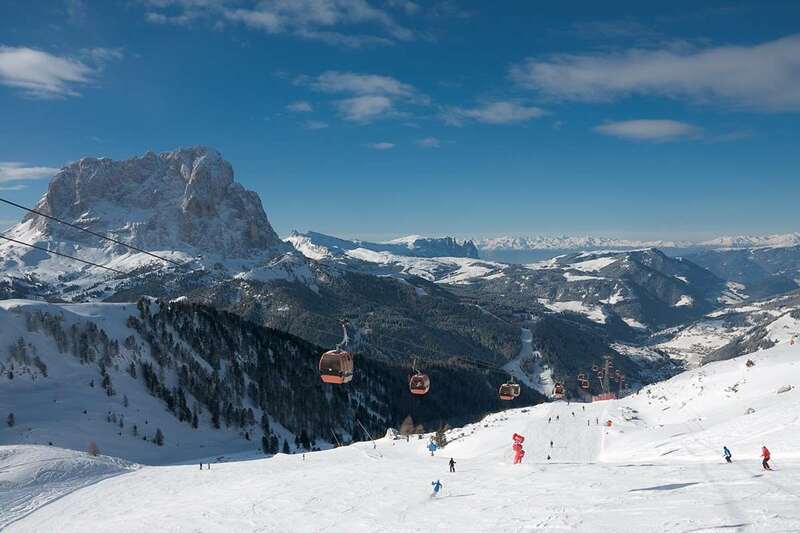 "For skiing the world masterpiece of the Sella Ronda, the Soldenella in Selva is great accommodation choice. A large chalet, built in typically Tyrolean style and recently refurbished with modern features, the Soldenella comes recommended as a great place to stay in a world class resort. " Guests have been delighted with this lovely chalet in Selva and its renovation in typically south Tyrolean fashion, with an eye for taste and style certainly appealed to guests over the last few seasons. The interior of the chalet was completely refreshed with modern furnishings, so the bedrooms are all glowing with fresh wood panelling, with comfortable bedroom furniture and tasteful fabrics adding to the fresh ambience. The en suite shower/wc rooms boast stylish fixtures and fittings, and all have the bonus of a fitted hairdryer. The dining-room and lounge both match the traditional, yet up-to-date feel, and offer our guests welcoming communal areas in which to share convivial meals and conversation, and the views from the lounge balcony are simply stunning! As a group of 26 we had the luxury of taking over the whole of Chalet Soldanella. First impressions were good, the chalet had obviously undergone recent refurbishment and the bedrooms, lounge and dining room were spotless. The meals were all up to an excellent standard and the cakes and tea in the afternoon were very much appreciated after a hard day's skiing. So, all in all, top marks for the chalet and staff. As for the resort itself, Selva and the surrounding Sella Ronda ski area was seriously impressive. I've been on plenty of ski holidays and I think the scenery and views are the most impressive I've seen. Plenty of mixed runs to attack and no chance of getting bored. In summary, great chalet and resort with a group of fantastic friends. Selva is an amszing resort with many runs — I have not skied so much for ages. The beauty of the Dolomites against blue sky — unbeatable. Soldenella well situated for lifts, food was excellent, rooms modern and bright. Chalet housekeeper and Chef were dreadful, made up for by two chalet hosts and Olly the Rep. Ski hire very easy and v helpful staff.